The Aircotec XC-TrainerEasy Alti-Vario-GPS is a great flight instrument for paragliding, paramotoring and hang gliding, with an integrated 20 channel GPS and high sensitivity Vario (unique Dual technology), ideal for entering your flights into the OLC (On Line Contest). Rechargeable Li-Ion 3.7V/1800mAh. Operating time per charging app. 40 hours. The instrument is equipped with an “intellicharge” system. To protect the Li-Ion battery the XC-Trainer will shut itself down when before the battery is completely flat, saving all flight data beforehand. Dimensions: 137 x 66 x 28 mm, weight including battery 150g. The integrated flight recorder saves position, altitude, clinb/sinkrate, SOG and heading every second for up to 18 hours. 6 editable waypoints can be stored. 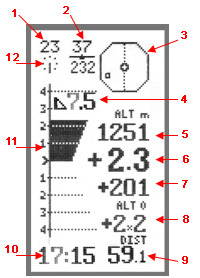 Windspeed, SOG, Altiude, Digital Vario, Barogramm, Gleide angle, Course Over Ground indicator (track off), Distance to chosen Takeoff, Way point or MARK, Clock, Compass, Wind direction. 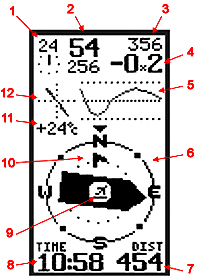 Windspeed, SOG, Altiude, Digital Vario, Speed discription curve, Visualised thermal, Distance to chosen Takeoff, Way point or MARK, Elapsed time flight, Direction to chosen Takeoff, Way point or MARK (track off), Wind direction. 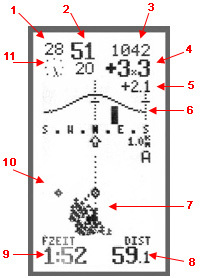 Windspeed, SOG, Direction to chosen Takeoff, Way point or MARK (track off), Gleide angle, Altiude, Digital & Analog Vario, Alt 0, Vario averager for the last 10,20 or 30sec, Distance to chosen Takeoff, Way point or MARK, Clock, Wind direction. See Aircotec's XC-Trainer series comparison table on the Aircotec website. Download the latest version of the XC-TrainerEasy Manual from the Aircotec website. Download the latest Aircotec software for the XC-TrainerEasy from the Aircotec website. The standard package does not include a PG or HG mount.